How is the Chamber involved in Legislative Affairs? 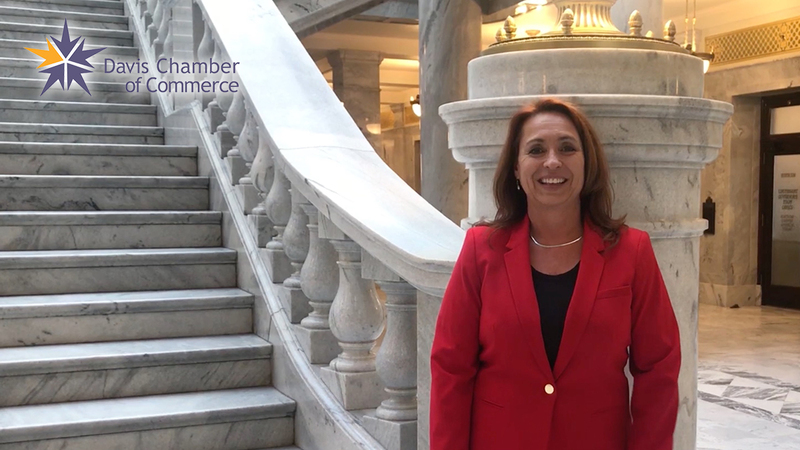 Hi, I’m Angie Osguthorpe, I’m the President of the Davis Chamber and today we’re here at the beautiful Utah Capitol. It’s one of the most beautiful in the entire nation. We’re here for two reasons today – our Legislative session and also we had the Leadership Institute here, all day long. We got to meet with the Governor, the Lieutenant Governor, we got to go to some committees, we got to talk to our Legislators and go to our Legislative Affairs Committee. That committee, our legislative affairs and the things that we do, down to your policy is one of the most important things we do in the Chamber. We want to make sure that our business community is healthy and that it’s vibrant and that we’re not over-regulating it. In our list of affairs, we have eight sub-committees, we talk about that. In Utah, if you don’t know, we have one of the shortest sessions of any state in the nation – it’s 45 days. It starts the third Monday in January and goes for 45 days. So we have a short amount of time to get a lot of stuff done. So, in the Chamber, we look at all the, like about 1,500 bills that come along and we ask ourselves, “Are they Chamber issues”? If they are, great. If they’re not, we’ll let somebody else take care of them. But if they are, we have eight sub-committees, things like air quality and capitol facilities and transportation, education, healthcare, business, and labor, economic development. We talk about all those issues and then we get together and discuss what we want to happen down here at the Capitol and then we talk to our legislators and say, “We love your bills” or “We don’t like your bills and we need to change them like this.” We have a great relationship with our legislators and, in fact, we are so lucky to have both the President of the Senate and the Speaker of the House from Davis County. It is a great time to be in Davis County and we do a lot of great things with our legislation. So, please come and join us and if you don’t know, we are working really tirelessly behind the scenes to make sure that we have a great Davis County, a great business community and a great quality of life.